Today, from scratch, I prepared a spinach salad, complete with spinach, eggs, shredded marble cheese, peanuts, sunflower seeds, and oil and vinegar dressing. It was very tasty. 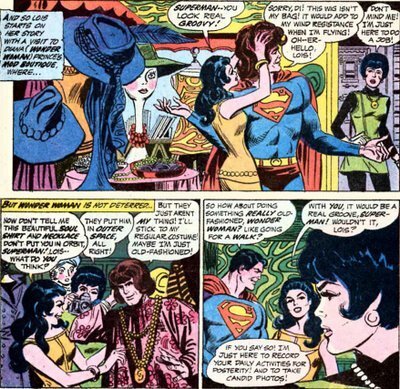 I didn't know that Diana (Wonder Woman) Prince owned a "mod boutique" until reading this 1969 issue of Lois Lane. Groovy. 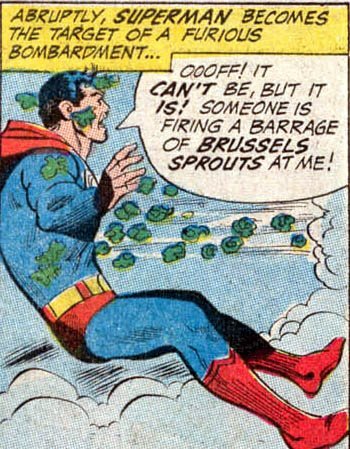 Superman claims that the wig isn't his bag because it'll increase his wind resistance when he flies. Uh...you're Superman. You can fly through the sun, and you're worried about the drag from a wig? I guess he was desperate for any excuse to get out of Diana's little game of dress-up. Needless to say, this issue's plot revolves around Lois' perennial jealousy over Wonder Woman. At this stage in comic book history, Wonder Woman was operating sans super-powers, using martial arts mojo and feminist determination to demolish her foes, so for once Lois thought she wasn't a threat...until this little scene. 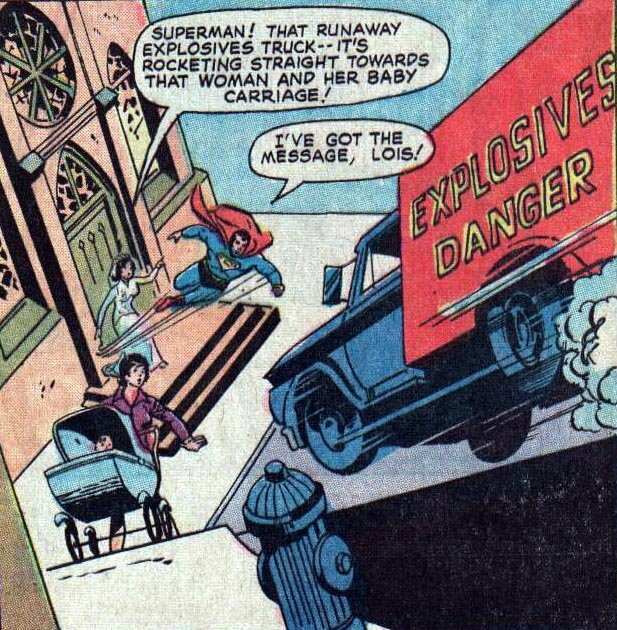 Why Lois keeps on pining after Superman I'll never know. Especially when Lana Lang is single. You're young, Lois - experiment a little. "It's a miracle you got out of that missle range with your 36-24-36 still intact!" 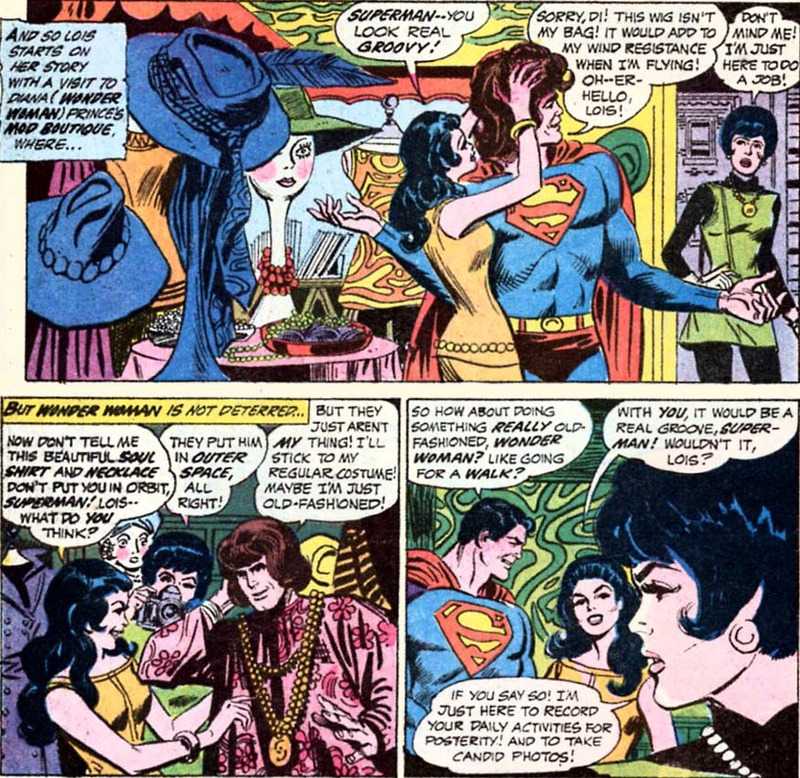 Gee, Superman - it's a good thing that Lois, as the hip 60s broad she is, doesn't mind being completely objectified. I've been as guilty of objectifying women as the next guy, but come on - you're Superman. You should hold yourself to a higher standard. And in the very next instant, after delivering a line like that, you propose? In the most offensive manner possible? Lois doesn't seem fazed, though. "He's proposing, just as the time-scope said he would!" 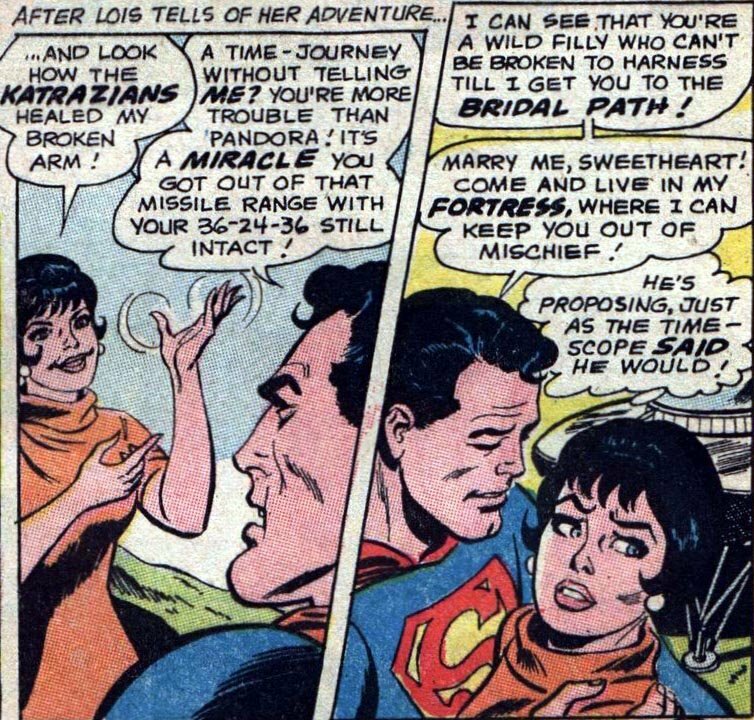 Apparently, the time-scope said Superman would propose as a thuggish lout. 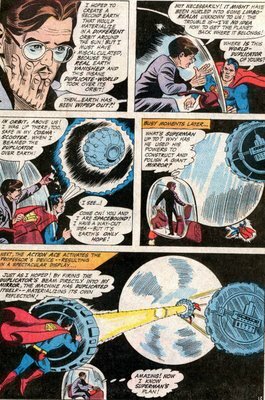 Those of you familiar with the comics may wonder if this was one of the infamous "imaginary stories," or if Superman is under the influence of a magic spell, alien mind ray, or the like. Nope. 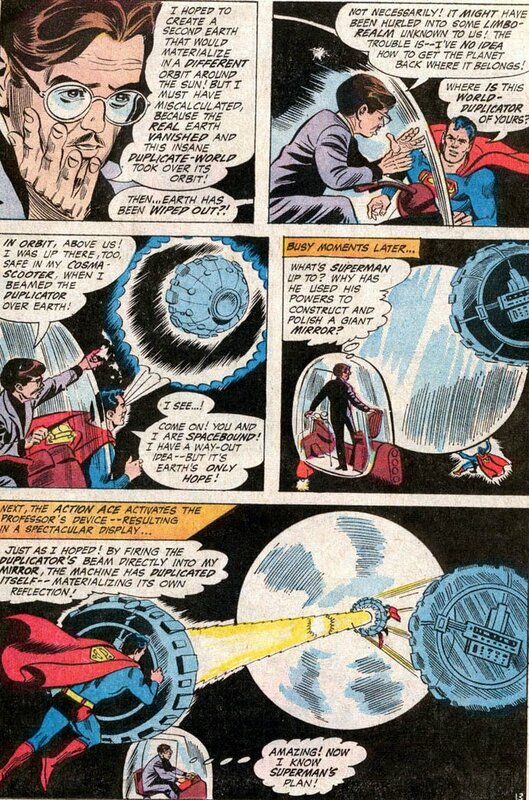 This story happened in the prime continuity of the Earth-1 years, and Superman was in his right mind. In other words, there's no excuse for his behaviour. Well, except maybe one. 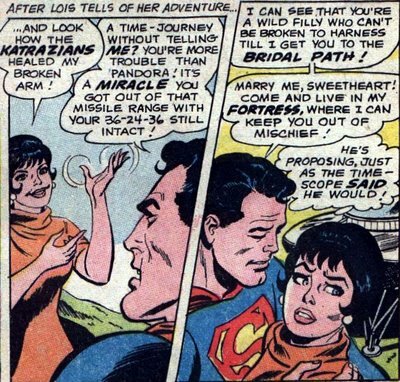 Stories in Lois Lane, as one might expect, bore a lot more resemblance to the romance comics of the day than other superhero books, and extremes of male and female behaviour were often portrayed in all their histrionic glory. Lois and her female supporting characters were obsessed with marriage and romance; male characters were just as stereotyped. Plus, as the viewpoint character, one might wonder if Lois is a reliable narrator or not. Ah, I'm just making excuses. 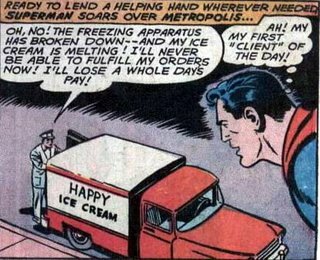 No Job Too Small...for Superman! Superman is known for saving the world against impossible odds, but one of the reasons I love the character so much is his simple humanity, and his willingness to help out wherever he's needed. There's no problem so inconsequential that Superman isn't willing to take a moment out of his busy day to address it. Here, Superman extinguishes a moderately dangerous stovetop fire with one puff of his super-breath. Were you or I in this situation, we would have had to put a lid on the pot to stop the blaze. Not the people of Metropolis! GREAT KRYPTON! Melting ice cream! 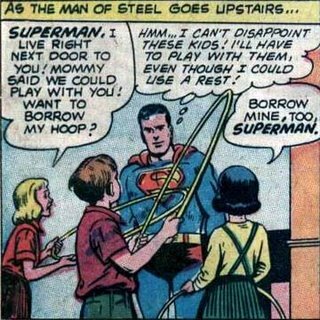 Thank goodness for Superman! Flying the truck up into space seems like an awful lot of trouble for such a trifling problem, but Superman isn't aggravated at all - he's happy to lend a hand. I do wonder why he didn't simply use his super-cold-breath power to chill the ice cream, though. I hope there's not a volcano erupting or train derailing somewhere. "Superman, six thousand villagers died with your name on their lips! 'Superman, save us!' they cried! But WHERE WERE YOU?" "Er, I was playing hula hoops with some of the neighbourhood kids..."
Of course, when a runaway truckful of dynamite is careening towards a helpless toddler, there's only one man to call. ...Superman, help! I can't open this jar of pickles! Superman! My little girl let go of her balloon! Superman! Help! I'M POOPING MY PANTS! As we see in this panel, comic book villains, too, have the ability to scream expository dialogue at a rapid pace. 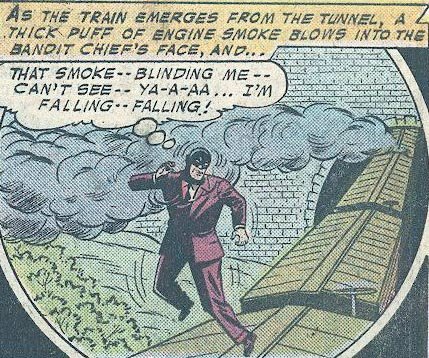 If I were about to fall from the top of a train, I'm sure all I've have time to yell would be "AAAAAAIIIIIIIIIIIIIEEEEEEEEEE" or some such. In this panel from the same story, Batman is incapacitated because he (snicker) steps on a pebble. Ooooooo, look out! It's Batman! Dread terror of the night! 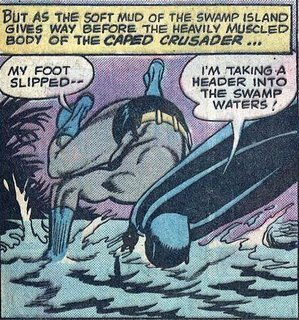 He's laid out for the rest of the story, leaving the task of capturing the bad guys up to Robin and Batwoman (a part-time superheroine/circus performer). 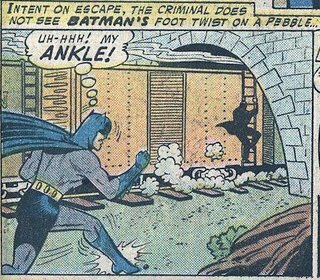 Poor Batman. One of the things that has always amazed me about superheroes is their ability to yell lengthy expository dialogue in record time. Batman, seen here, can think quickly enough to recognize his predicament and finish talking about it before his head hits the murky brine - and he's not even supposed to have any super-powers. Pretty astounding, when you think of it. "Doctor Doom's energy suit - BOOBY TRAPPED! It's radiating a concentrated burst of gamma rays, rendering me unconscious! I'm - I'm passing out! Unnnnhhh!" How I love comic books. 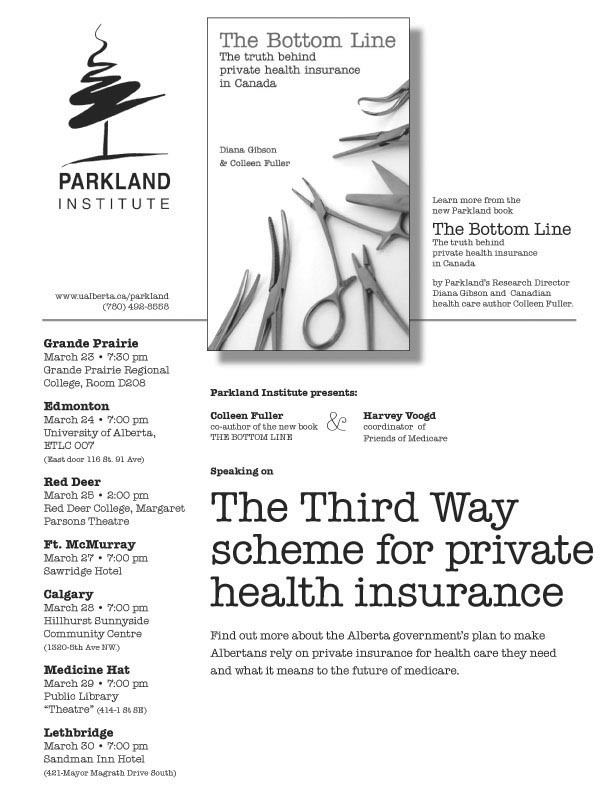 I'm still sick, and sicker thanks to health "reforms" the Alberta government is currently shilling. It's snake oil for the 21st century - reassuring words and a bottle of bitter water. If anyone wants to accompany me, let me know. 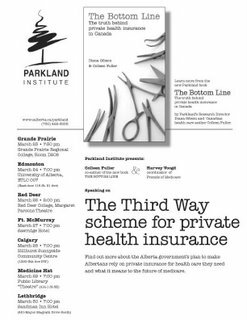 March 24th, U of A. During the course of his storied career, Superman has fought all manner of dangerous foes - from the insidious evil of Lex Luthor to the brutal buffoonery of Bizarro. That makes everything so much clearer. I love the "Your President Loves to Point" poster at lower left. This is a job for...uh, what the hell? Needless to say, the duplicate duplicator, when switched on, sets matters to right, pulling the real Earth out of limbo and sending the bogus Earth into another dimension, where its inhabitants presumably enjoy their wacky alternate lives to this day. 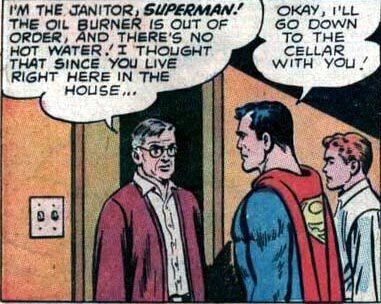 Superman had a tough job. Imagine living on a world in which random good-natured geniuses ("Professer Nurd?" I mean, really) can cause globe-spanning catastrophes without intending any harm. And on top of that, you have people like the Toyman creating deadly hula hoops, giant gorillas with a wide range of super-powers and sociopathic tendencies, as well as the hassle of maintaining a secret identity. 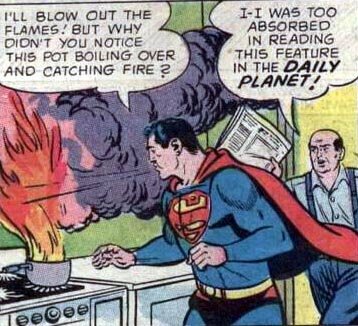 It's a wonder Superman isn't in the loony bin. I haven't been sick in a while, so I guess I should have suspected that when illness came it would be a doozy. Well, for a head cold; I'm certainly not complaining, given all those who are suffering from far worse maladies. "S! It's my favourite letter." The short actually scared me a little as a kid, partly because of Superman's deep voice, the sound effects of the spaceship and storm, and the music, which I recall as vaguely threatening. Anyone else remember the short? 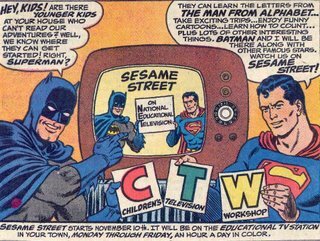 And did Batman ever appear on Sesame Street? I'm home sick today, and Sylvia suggested I pop a couple of Advil Cold & Flu. When I opened the bottle, I noticed one of those preservative gel-packs, packaged in the form of a little barrel. "DO NOT EAT" was stamped on the side of the little barrel, and it made me laugh. "What's this?" I said, "DO NOT EAT, hee hee hee," I giggled. "If it didn't say that, you would SO eat it," Sylvia said.